Background: With the increasing serious problem of water environment pollution, it is a hot spot to study the high efficient sewage treatment method. Owning to the photosensitization of carbon nanomaterials, carbon doped TiO2 (C-TiO2) has higher photocatalytic activity. Method: Here, we proposed a new method, carbon-assisted method, to prepare C-TiO2 nanomaterials. We first used degreasing cotton as a dispersant to fully absorb the TiCl4 sol. Results: After high-temperature calcination, C-TiO2nanomaterials were obtained. 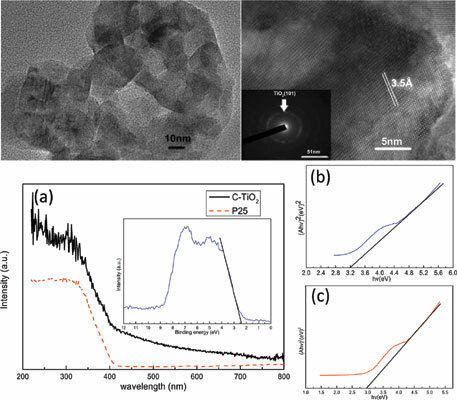 Characterizations results showed that the high specific surface area C-TiO2 nanomaterials in the size of about 50 nm showed a broader light absorption and narrower bandgap spectrum than P25 (commercial TiO2 nanoparticles). Conclusion: The C-TiO2 nanomaterials showed stronger photocatalytic ability than P25. C doped TiO2, nanomaterials, carbon-assisted method, photocatalysis, water treatment, environmentally friendly.